A viewing will be held on Thursday, October 11th from 4:00 PM to 7:00 PM. It is at Sampson Funeral Home, 21 Tinkham Road, Springfield, MA. Bro. Darling’s funeral will be held on Friday, October 12th at 10:00 AM. It is at Wilbraham United Church on 500 Main Street, Wilbraham, MA. Edgar W. Darling poses for his Grand Master’s portrait. Edgar William Darling of Wilbraham was elected the 71st Grand Master of Masons in Massachusetts Dec. 13 and installed to that office Dec. 27. 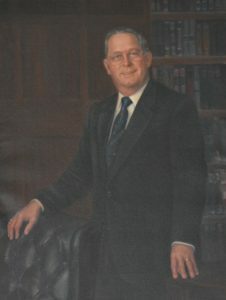 A Director of Grand Lodge and the Masonic Home for several years, he is the first man from western Massachusetts to be elected and installed since 1928 when M. W. Herbert W. Dean (1929-31) from Cheshire served that office. Raised in Esoteric Lodge, Springfield, on April 19, 1951, he was Master of that Lodge in 1958 and has since affiliated with Newton Lodge of Wilbraham. He was appointed by M. W. Donald W. Vose as the District Deputy of the Chicopee 18th Masonic District for 1974 and 1975. He was elected Junior Grand Warden and served in 1979. Appointed Grand Representative to the Grand Lodge of Kansas, he is an Honorary Past Junior Grand Warden of that jurisdiction. He has served on advisory boards for Rainbow and DeMolay, been a Lecturer for the Fifth Lodge of Instruction in Springfield, and a speaker for the Grand Lodge Education Department. He is a member of Scottish Rite Bodies in the Valley of Springfield and is the Second Lieutenant Commander of the Connecticut Valley Consistory. His York Rite memberships are with Morning Star Chapter, where he is a Past High Priest, Past District Deputy Grand High Priest of the 5th Capitular District, and Grand King of Grand Chapter. He is Past Illustrious Master of Springfield Council and has been Grand Lecturer for the Grand Council of Royal and Select Masters of Massachusetts. A Past Sovereign of Saint Matthew’s Conclave Red Cross of Constantine, he holds membership in the Massachusetts College of Rosicruciana. Active in Melha Temple, Shrine, he is a member of Springfield Coufi 144, Royal Order of Jesters. The husband of Lilla (Taft) Darling, they are parents of Nancy J. Como, Allen D. Darling, and Judith G. Darling, and grandparents of Kathleen and Matthew Darling and Sarah Ashley Como. The family has been associated with the South Congregational Church of Springfield where he has been a Deacon, Vice Chairman of Christian Education, head usher and Chairman of the Committee on Membership and has served as the President of the Men’s Club. Educated in Springfield public schools, he is a graduate of Springfield Technical High School, and attended Western New England College. He was employed for 31 years in the Northeast Utilities System with Western Mass. Electric Co. until his retirement in mid-December as the Director of Major Projects and Nuclear Fuel Purchases. He was a member of the Western Mass. Purchasing Management Association, Pooled Inventory Management for Nuclear Power Plants and the Edison Electric Institution Committee for Materials Management and Procurement. During World War II he attended the U.S. Merchant Marine Academy at Kings Point, NY, and served in the Atlantic, Mediterranean and Pacific Theaters of War. Installed as the 71st Grand Master of Masons in Massachusetts on Dec. 27, Edgar William Darling of Springfield set the tone for the coming year when addressing his audience at the Feast of St. John the Evangelist: “We have high standards that this world needs and we will not lower but standards to suit any individual or any group of people, but we must work together to bring the world up to our moral code of living. Society has paid a big price for its permissive living, creating a troubled youth in the world. I saw a bumper sticker that said, “The Quiet Fraternity.” Not any more, my Brethren, we’re going to be heard and seen because we have nothing to be ashamed of and I ask you to join me toward that goal!” He was installed by M. W. Albert T. Ames, the retiring Grand Master. Full biography available at MasonicGenealogy.com.